1. GDP report: The US economy roared into high gear in the spring, growing at the fastest pace in almost four years. Second-quarter economic growth came in at an annual rate of 4.1%, the government reported Friday. That was the best showing since the third quarter of 2014. By many metrics, the United States economy is in excellent shape: Unemployment is near an 18-year low, factories are seeing more orders, and exports are surging. Economists are generally predicting slower growth in the second half of the year, as the effects of the tax cut wear off and rising interest rates depress consumer spending. 2. Amazon delivers: The tech company has topped $2 billion in quarterly profit for the first time in its history, an impressive run fueled by continued growth in Prime subscriptions, cloud computing and its nascent advertising business. Amazon said Thursday that it earned $2.5 billion in profit for the three months ending in June, a staggering jump from the $197 million it posted in the same period last year. It marked the third consecutive quarter that Amazon has topped $1 billion in profit, a remarkable feat for a company once known for investing so much in its business that it often lost money. Shares in Amazon (AMZN) were up in premarket trade. 3. Disney deal: Disney's (DIS) acquisition of most of 21st Century Fox (FOX) is about to become official. Fox shareholders are scheduled to meet on Friday and are expected to approve the deal. Comcast (CCZ) was bidding for the same assets but dropped out earlier this month. During the bidding war, Fox's market value surged 36%. Disney may now have the most formidable content portfolio in all of Hollywood, adding to an already impressive stable that includes Marvel, Pixar and LucasFilm. 4. Market movers: Twitter (TWTR) stock is down 15% premarket after the messaging platform reported earnings ahead of the open. The company saw its user base shrink in the second quarter. Shares in Expedia (EXPE) and Chipotle (CMG) were among the top gainers in premarket trading. Facebook (FB) shares bounced back 2% premarket after sustaining record-breaking losses on Thursday. Shares in Chinese e-commerce firm Pinduoduo (PDD), which shot up 40% during their Nasdaq debut on Thursday, were set to rise another 7%. Intel (INTC) and Electronic Arts (EA) dipped premarket as investors reacted to their latest earnings. 5. Deal makers: Shares in BHP (BBL) advanced 4% in London after the company announced it sold its US shale assets for $10.8 billion. Most were purchased by UK energy giant BP (BP). Chesapeake Energy (CHK) also made a deal: The firm announced it was selling all its shale land in Ohio to Encino Acquisition Partners for about $1.9 billion. Chesapeake stock surged 10% premarket. 6. Global market overview: US stock futures were holding steady. 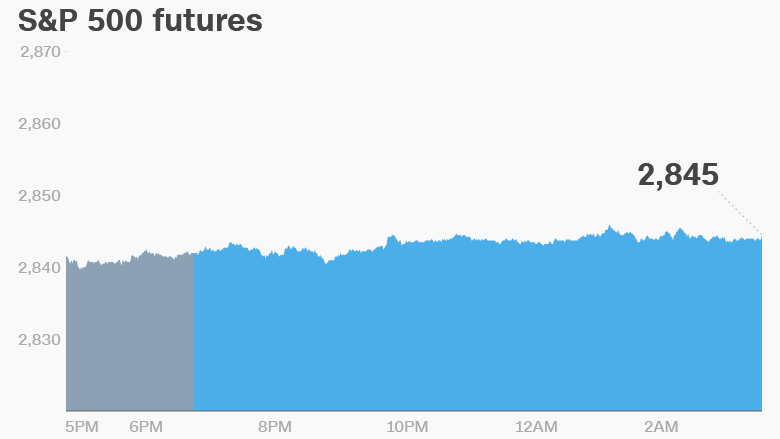 European markets were mostly edging up in early trading. Asian markets ended the day with mixed results.